This is the seventh installment of a position-by-position preview of the 2019 NFL Draft. Defensive tackle ranks as one of the more talent-rich areas in the NFL draft. Many prognosticators believe Alabama’s Quinnen Williams ranks at the top of this year’s college crop, regardless of position, even though Arizona could have its sights set on Oklahoma quarterback Kyler Murray as the No. 1 overall pick. They also can see at least a half-dozen defensive tackles selected in the first two rounds. Besides Williams, other defensive tackles widely viewed as worthy of first-round grades are Houston’s Ed Oliver and Clemson’s Dexter Lawrence. Another Clemson product, Christian Wilkins, is seen as going no later than the second round, with Mississippi State’s Jeffery Simmons and Notre Dame’s Jerry Tillery also falling into the second-round category. After Day 2, however, the consensus is that the quality of available tackles drops significantly. “Defensive tackle has been held up as this draft’s strong suit, and for good reason — the position could produce as many as seven or eight of the top 50 players selected in this year's draft,” NFL media draft analyst Lance Zierlein wrote for NFL.com. 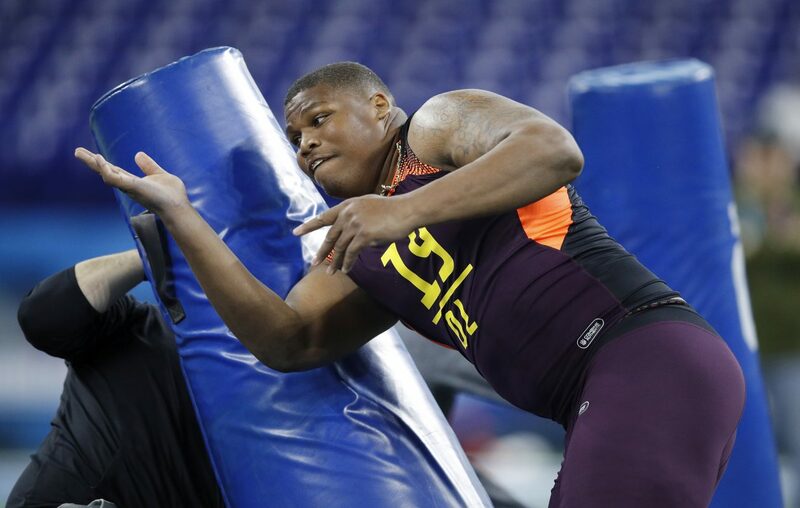 “Guys like Quinnen Williams, Christian Wilkins, Ed Oliver, Dexter Lawrence and Jeffery Simmons have received plenty of attention as first-round candidates, and the position's riches will spill into Day 2 of the draft. Overall draft grade for the position: A-. The best: Quinnen Williams, Alabama. You might be hard-pressed to find a better or more complete player in the draft. After a college career of dominating the middle of the line, there’s every reason to believe he’ll do the same at the next level. He has size (6-foot-3, 303 pounds), strength, quickness and athleticism. He routinely made it into the backfield to stop run plays almost as soon as they began. He also was a major inside pass-rushing force. The best part for the team that selects Williams is that he enters the draft as a red-shirt sophomore, meaning there is room for him to develop physically and mentally as a pro. Bills view: This could easily qualify as the Bills’ top area of need. Much has been made about the leadership the Bills lost with Kyle Williams’ retirement, but the team also lost their most disruptive inside force on defense. Despite his advanced age, Kyle Williams had more of a consistent impact than Star Lotulelei. He also was better than Jordan Phillips and Harrison Phillips. The Bills must find a high-end replacement for Kyle Williams, and the draft figures to give them a good opportunity to do so at the ninth overall spot or elsewhere in the first round if they should move via trade. "Take a seat, mom": Growing up without a father in a small town in Louisiana, Alabama defensive tackle Isaiah Buggs saw the struggles his mother went through to raise him and his siblings. He has used that as a driving force to become a good enough player to make big money in the NFL. Sleeper: Demarcus Christmas, Florida State. Although he could end up being an undrafted free agent, he has plenty of qualities that will convince a team to sign him. At 6-3 and 302 pounds, he has good size, strength and is a decent athlete. His forte is playing the run, and he consistently gives tremendous effort. 1. Quinnen Williams*, Alabama, 6-3, 303. He comes from a school with a strong reputation for producing quality D-linemen, but the guy could very well to be one of its all-time best. 2. Ed Oliver*, Houston, 6-2, 287. Tremendous quickness and explosiveness likely will convince a team to overlook his relative lack of size and decline after dominant ’17 season. 3. Dexter Lawrence*, Clemson, 6-4, 342. Remarkably athletic for his size and, while he can dominate in close quarters, he’s excellent in pursuit and uses his hands well to disengage. 4. Christian Wilkins, Clemson, 6-3, 315. Had strongly considered entering the draft last year, but believed he could elevate his draft status by sticking around and seemingly did so. 5. Jeffery Simmons*, Mississippi State, 6-4, 301. He could do a better job as a pass-rusher, but he shows consistently good effort and does a nice job as a run-stuffer. 6. Jerry Tillery, Notre Dame, 6-6, 295. Recruited to play offensive tackle, he made a smooth transition to the defensive line as a freshman and has shown steady improvement. 7. Isaiah Buggs, Alabama, 6-3, 306. Shows excellent quickness, which serves him well when rushing the passer, and his versatility is highly impressive. 8. Gerald Willis III, Miami, 6-2, 302. His natural talent is considerable, although if he’s going to be a successful pro, he needs to work on improving his techniques. 9. Dre’Mont Jones*, Ohio State, 6-3, 281. Despite drawing high marks for his athleticism, he falls short as a play-maker, a contradiction that could be a big concern for some teams. 10. Charles Omenihu, Texas, 6-5, 280. His performance at defensive tackle in college was solid, yet some scouts believe he doesn’t have a wide enough body to succeed at the position in the NFL.